This farmhouse in Bateseburg-Leesville was built around 1855 by contractor West Hare for planter and tavern owner Colonel John Lee. Colonel Lee had the home built for his daughter, Elizabeth, and it originally sat about a quarter of a mile from where it now stands. The tavern owned by Lee was inherited from his father, Andrew Lee. Local lore claims that President George Washington stopped at the Lee tavern on his 1791 Southern tour. Incidentally, Leesville is named for Colonel John Lee. Neighboring communities Batesburg and Leesville consolidated in 1993 to create a single municipality, Batesburg-Leesville. Elizabeth Lee was married twice. She was first married to Dr. Hugh Spencer Lee, who died in 1858. She later married Henry Arthur Fort. A Civil War story holds that General Sherman knocked on the door of the home and asked Elizabeth if she had any slaves. When she replied that she did not, General Sherman spared the home. However, there were two slave cabins and an overseer’s house on the home’s original property. Following the war Elizabeth owned and operated a cotton gin, and when she died at the end of the nineteenth century – some sources say 1896, others say 1898 – the home was bought by her lawyer, Edwin Struthers. Struthers rented the home to the Oswald family, who had to vacate their home along the Saluda River during the construction of Lake Murray in the 1920s. In 1927 Jane Struthers, wife of Edwin Struthers, sold the home and surrounding 507 acres of land to Annie Taylor. Taylor in turn sold it to her husband, William Taylor, for five dollars. The reason for this transaction is unclear. The home remained in the Taylor family until 1993. That year the home was purchased by Cathy and Tommy Smoake, who relocated the house less than a mile away to a five-acre plot they purchased from Earl Oswald. Oswald was born in the home in 1924 when it was being rented to his family, and he relayed much of its history to the Smoakes. The information above was taken from an article published in The State on August 25, 1994. We are grateful to author Kay Gordon. A transcript can be seen below these images of the article. 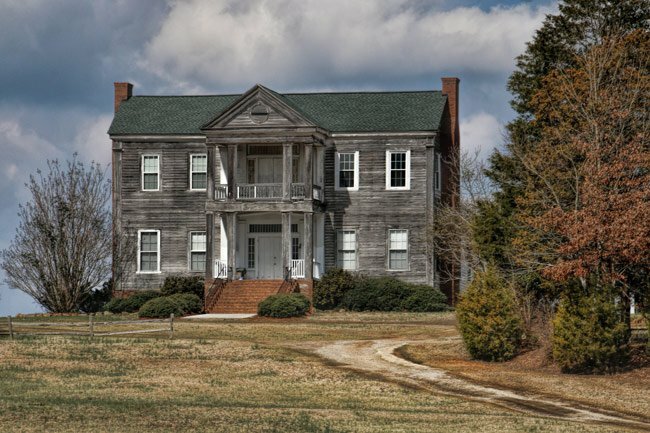 Time is turning back more than a hundred years for a 19th-century plantation house near Batesburg-Leesville. 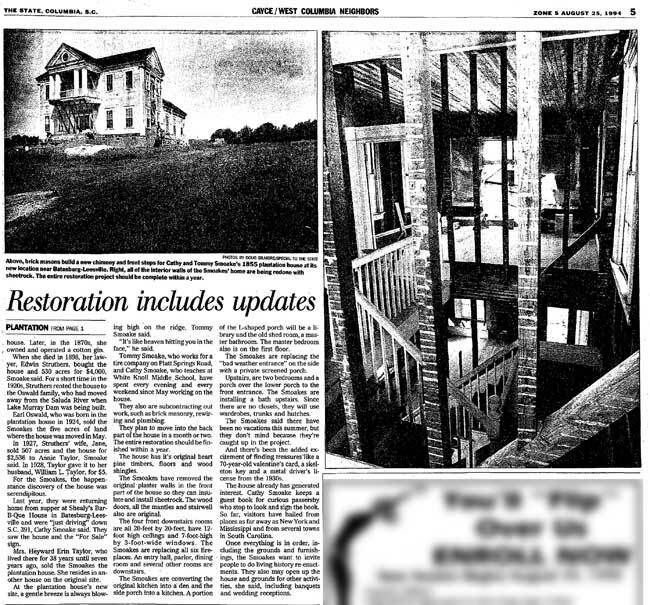 A Springdale couple, Cathy and Tommy Smoake, are restoring the 4,000 square-foot antebellum house, inside and out, for their home. The Smoakes bought the home on S.C. 391 last August and had it moved in May from the original site a quarter of a mile away to the middle of a 5-acre tract, where it sits on a high ridge. Part of the restoration project involves research, which has led to delving into family history. The Smoakes have always been interested in antiques and now, Cathy Smoake said, she’s becoming a historian, too. Smoake said the house qualifies for the National Register of Historic Places and she’s going through the application process now. In her research, Smoake found Col. John Lee had the house built for his daughter, Elizabeth, around 1855. West Hare was the builder. Lee was a planter, but he also had inherited a tavern from his father, Andrew Lee. In 1791, it is said George Washington stopped for breakfast at Lee’s stage coach tavern. A marker describing the event stands in Batesburg-Leesville on U.S. 1 near St. Paul’s Independent Methodist Church. Nearby, next to NationsBank, is the Lee family cemetery. At one time, Lee had 40 slaves, Smoake said. At the original site, there were two slave houses and an overseer’s house. Lee and his wife, Eleanor, had 10 children, including Elizabeth. Elizabeth, who died in 1898, outlived her children, parents, brothers, sisters and two husbands. She was strong-willed, educated and had a good business head, Smoake said. During the Civil War, Gen. William Tecumseh Sherman came to the front door and asked Elizabeth if she had any slaves. She told him, “No,” and he spared the house. Later, in the 1870s, she owned and operated a cotton gin. When she died in 1898, her lawyer, Edwin Struthers, bought the house and 530 acres for $4,000, Smoake said. For a short time in the 1920s, Struthers rented the house to the Oswald family, who had moved away from the Saluda River when Lake Murray dam was being built. Earl Oswald, who was born in the plantation house in 1924, sold the Smoakes the five acres of land where the house was moved in May. In 1927, Struthers’ wife, Jane, sold 507 acres and the house for $2,536 to Annie Taylor, Smoake said. In 1928, Taylor gave it to her husband, William L. Taylor, for $5. For the Smoakes, the happenstance discovery of the house was serendipitous. Last year, they were returning home from supper at Shealy’s Bar-B-Que House in Batesburg-Leesville and were “just driving” down S.C. 391, Cathy Smoake said. They saw the house and the “For Sale” sign. Mrs. Heyward Erin Taylor, who lived there for 38 years until seven years ago, sold the Smoakes the plantation house. She resides in another house on the original site. At the plantation house’s new site, a gentle breeze is always blowing high on the ridge, Tommy Smoake said. “It’s like heaven hitting you in the face,” he said. Tommy Smoake, who works for a tire company on Platt Springs Road, and Cathy Smoake, who teaches at White Knoll Middle School, have spent every evening and every weekend since May working on the house. They also are subcontracting out work, such as brick masonry, rewiring and plumbing. They plan to move into the back part of the house in a month or two. The entire restoration should be finished within a year. The house has its original heart pine timbers, floors and wood shingles. The Smoakes have removed the original plaster walls in the front part of the house so they can insulate and install sheetrock. The wood doors, all the mantles and stairwell also are original. The four front downstairs rooms are all 20-feet by 20-feet, have 12-foot high ceilings and 7-foot-high by 3-foot-wide windows. The Smoakes are replacing all six fireplaces. An entry hall, parlor, dining room and several other rooms are downstairs. The Smoakes are converting the original kitchen into a den and the side porch into a kitchen. A portion of the L-shaped porch will be a library and the old shed room, a master bathroom. The master bedroom also is on the first floor. The Smoakes are replacing the “bad weather entrance” on the side with a private screened porch. Upstairs, are two bedrooms and a porch over the lower porch to the front entrance. The Smoakes are installing a bath upstairs. Since there are no closets, they will use wardrobes, trunks and hutches. The Smoakes said there have been no vacations this summer, but they don’t mind because they’re caught up in the project. And there’s been the added excitement of finding treasures like a 70-year-old Valentine’s card, a skeleton key, and a metal driver’s license from the 1930s. The house already has generated interest. Cathy Smoake keeps a guest book for curious passersby who stop to look and sign the book. So far, visitors have hailed from places as far away as New York and Mississippi and from several towns in South Carolina. Once everything is in order, including the grounds and furnishings, the Smoakes want to invite people to do living history reenactments. They also may open up the house and grounds for other activities, she said, including banquets and wedding receptions. From what we are told, it was located along the same route, just slightly further down the highway. Did this house originally sit on Devils Backbone Road? If not where was the original location? Yes, you may! Thank you for asking. What a beautiful place to grow up. I would like to print this article as my father was born in the house. Do I have permission to do so? I moved into this area in 1989 just before the house was getting prepared for moving. Thanks for sharing this article. 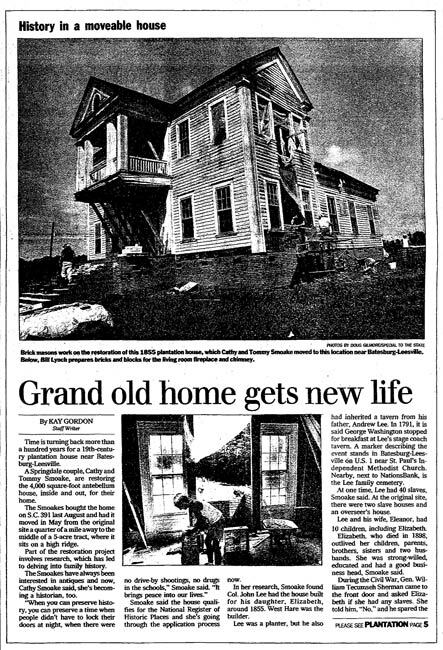 We too have admired this home and wondered if it was being restored. My in-laws used to have a place at Lake Murray and we always pass by to go visit them. Always made a point to watch for this house and see what was going on. My son recently sent me this link to make sure I got to see what was going on with the home. Love the article! Ms. Watts, this article is from 1994. The restoration is nearing 30 years of completion now. All the house needs is a good cleaning of the siding and a paint and sealant. The windows, porch, steps, and roof are all solid.